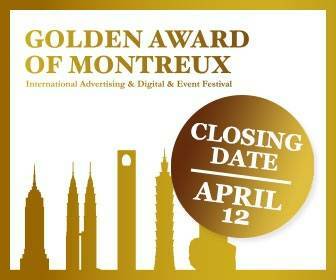 The 27th edition of Golden Award of Montreux Advertising Festival is scheduled this year on Lake Geneva in Switzerland on April 21, 2016. Montreux Festival is a precursor to Cannes and every year many Cannes aspirants test their work at Montreux .Winners at Montreux get splashed in Ad Forum, Little Black Book, Campaign UK. BBDO New York was the most successful agency at last year’s Montreux Festival for their work on Mars Chocolates, GE, Fedex, Footlocker, etc. Other prominent winners were Leo Burnett Germany, BETC France, TBWA Paris, Arnold Madrid, Havas Worldwide, and AMVBBDO UK. Festival in steadily increasing numbers as the pan-European Festival is concentrating on improving Asian participation in the Festival. This year’s jury includes Molly Adler, BBDO (New York); Michele Dim D’Ippolito, Dim&Canzian (Brazil); Frank Bodin, Havas (Switzerland); Davide Boscacci, Leo Burnett (Turin); Deigo Oliviera, AMV BBDO (London); Petter Gulli, DDB (Oslo); Alex Holder, Anomaly; Olivier Teepe, Cloudfactory (Netherlands); Matt Swinburne, McCann (New York), and Luis Silva, FCB (International). Last date for receiving entries is April 12, 2016. FedEx picked as main sponsor for UEFA Europa League! FedEx unveils strategic acquisition deal in Southern Africa! FedEx asks Mumbaikars to donate packaged drinking water to drought-affected villagers!